Available Colors: Black, Royal Blue, Khaki or Orange, all with Black Trim and Belt. Shipping Weight: 50 per carton @ 22 lbs. Customized All-in-One Electronic Friendly Fanny Pack Item #HT-4207S (Minimum Order: 50). 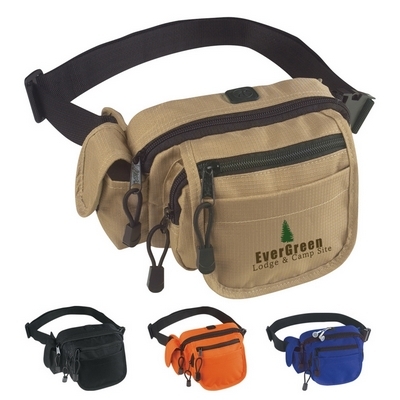 Promotional Customized Fanny Packs can be personalized with your business logo. Our Promotional Fanny Packs are decorated with No Setup Fees. 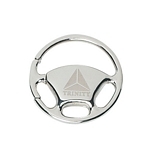 Customized Oval Silver Key Chain Item #HT-4702 (Minimum Order: 250). Promotional Key Chains like the Oval Silver Key Chain can be personalized with your business logo and with No Setup Fees. Customized Rectangle Silver Key Chain Item #HT-4704 (Minimum Order: 250). 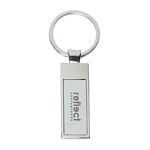 Promotional Key Chains like the Rectangle Silver Key Chain can be personalized with your business logo and with No Setup Fees. 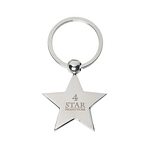 Customized Star Silver Key Chain Item #HT-4705 (Minimum Order: 250). Promotional Key Chains like the Star Silver Key Chain can be personalized with your business logo and with No Setup Fees. 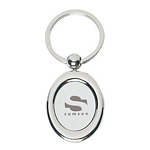 Customized Wheel Silver Key Chain Item #HT-4700 (Minimum Order: 250). Promotional Key Chains like the Wheel Silver Key Chain can be personalized with your business logo and with No Setup Fees.